It's time for another EverQuest Next Landmark video dev diary. Your host is EQNL lead systems designer Michael Mann, and he's a got a lot to say about harvesting tools. He enlists a bit of help from lead character artist Kacey Helms, who takes viewers on a journey from in-game axe concept to finished in-game axe model. Next up is lead animator Aaron Carlson, who shows off mining animations, followed by VFX artist Lisa Charriere, who explains what SOE's thinking in terms of particle effects. Finally, we're treated to a sneak peak of the Pulverizer, which is a new tunneling tool currently in the works. Click past the cut for the full video! 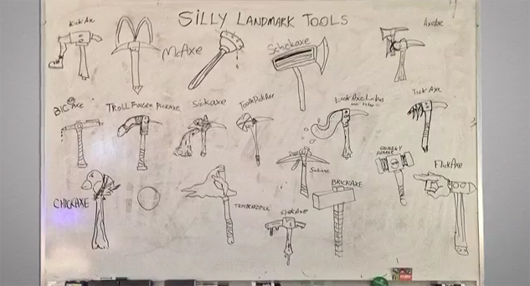 Landmark video diary hints at the Pulverizer, new harvesting tools originally appeared on Massively on Mon, 03 Mar 2014 19:30:00 EST. Please see our terms for use of feeds.